Moreover, the worst of all is, that when once religion begins to be composed of such vain fictions, the perversion is immediately succeeded by the abominable depravity with which our Lord upbraids the Pharisees of making the commandment of God void through their traditions (Mt. 15:3) [IV, 10:10]. What is meant by making the word of God void by tradition, if this is not done when recommending the ordinances of God only frigidly and perfunctorily, they nevertheless studiously and anxiously urge strict obedience to their own ordinances, as if the whole power of piety was contained in them; [IV, 10:10]. These quotes from Calvin are said to be "Denigration of Tradition" (p.18). 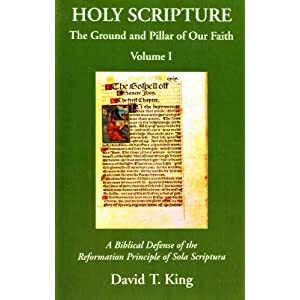 Earlier in IV, 8, Calvin describes Biblical authority by describing the rule of the church, Moses, Old Testament priests, prophets, and the apostles. He concludes in IV, 8:9 that not even the apostles were free to go beyond the Word, nor are their successors in creating laws necessary for salvation. The main point to grasp is that the Bible does indeed describe authority. It simply doesn't describe the Roman authority that plagued the church of Calvin's day. The papal church claimed an infallible authority, an authority Ford Lewis Battles describes with the heading "in which the pope, with his supporters, has exercised upon souls the most savage tyranny and butchery" by creating extra-Biblical laws necessary for salvation. Moreover, this evil thing is added, that when religion once begins to be defined in such vain fictions, such perversity is always followed by another hateful depravity, for which Christ rebuked the Pharisees. It is that they nullify God’s commandment for the sake of the traditions of men. I do not wish to fight with words of my own against our present lawmakers; let them win, I say, if they can in any way cleanse themselves of Christ’s accusation. But how could they excuse themselves, since among them it is far more wicked to have skipped auricular confession at the turn of the year than to have led an utterly wicked life the whole year through? to have infected their tongue with a slight taste of meat on Friday than to have fouled the whole body with fornication every day? to have moved the hand to honest work on a day consecrated to some saintlet or other than religiously to have exercised all the bodily members in the worst crimes? for a priest to be bound in one lawful marriage than to be entangled in a thousand adulteries? to have left unperformed an avowed pilgrimage than to have broken faith in all promises? not to have squandered something on monstrous, but no less superfluous and unprofitable, pomp of churches than to have failed the poor in their extremity? to have passed by an idol without honoring it than to have treated the whole race of mankind abusively? not to have murmured long senseless words at certain hours than never to have framed a lawful prayer in the mind? What is it to set at nought God’s precept for the sake of their own traditions if it be not this? While commending the observance of God’s commandments only coldly and perfunctorily, they nonetheless zealously and busily urge an exact obedience to their own, as if these contained in themselves the whole force of piety? While requiring that only light amends be made for the transgression of the divine law, they punish even the slightest infraction of their decree with no lighter penalty than prison, exile, fire, or sword. But to trace the origin of these traditions (with which the church has hitherto been oppressed) back to the apostles is pure deceit. For the whole doctrine of the apostles has this intent: not to burden consciences with new observances, or contaminate the worship of God with our own inventions. Again, if there is anything credible in the histories and ancient records, the apostles not only were ignorant of what the Romanists attribute to them but never even heard of it. And let them not prate that most of the apostles’ decrees which were not committed to writing had been received in use and customary practice. The reference is to those things which, while Christ was still alive, they could not understand but after his ascension learned by the revelation of his Holy Spirit. That has to be analyzed more closely, because Jesus also observed Pharisaical traditions (the true ones), and Paul called himself a Pharisee (in Scripture) three times (Acts 23:6; 26:5; Phil 3:5). There are true and false traditions. Protestants too often condemn all "traditions," as if they have none, and as if there are no true traditions described and sanctioned in Holy Scripture. To the extent that promulgation of Church laws and divine laws were done in this legalistic, loveless fashion, sin occurred, just as Jesus condemned the Pharisees for their similar hypocrisy and rigid legalism and misplaced emphases (in Matthew 23). But Jesus also upheld the fundamental authority of the Pharisees in the early part of the chapter, just before he condemned their hypocrisy in practice. Therefore, the presence of hypocrisy (excessive rigidity, legalism, lack of love, etc. ), does not in and of itself prove that the laws themselves are invalid, or that the authorities who proclaim them are no authorities at all. Jesus taught this (not just Catholics, later on). We are not at liberty to disagree with Him. Many are prone to the legalistic sins of Pharisaism in its worst sense. That is not by any means confined to Catholics; nor does it disprove any Catholic belief. 15. Hold fast the institutions. Some restrict this to precepts of external polity; but this does not please me, for he points out the manner of standing firm. Now, to be furnished with invincible strength is a much higher thing than external discipline. Hence, in my opinion, he includes all doctrine under this term, as though he had said that they have ground on which they may stand firm, provided they persevere in sound doctrine, according as they had been instructed by him. I do not deny that the term paradosis is fitly applied to the ordinances which are appointed by the Churches, with a view to the promoting of peace and the maintaining of order, and I admit that it is taken in this sense when human traditions are treated of,(Matthew 15:6.). Paul, however, will be found in the next chapter making use of the term tradition, as meaning the rule that he had laid down, and the very signification of the term is general. The context, however, as I have said, requires that it be taken here to mean the whole of that doctrine in which they had been instructed. For the matter treated of is the most important of all—that their faith may remain secure in the midst of a dreadful agitation of the Church. As to quote #2, the Roman Catholic author probably didn't read IV, 10:27. Calvin states that simply because the papacy has abused her people with laws and traditions, this doesn't mean that all laws by which the church is shaped should be erased. Calvin argues that laws are necessary for order, but "They are not to be considered necessary for salvation and thus bind consciences by scruples; nor are they to be associated with the worship of God, and piety thus be lodged in them." So are the Calvin quotes cited a "denigration of Tradition"? No, they are the denigration of an authority that claims to be infallible that has added to God's revealed truth with false Traditions.